The story of Chile's success starts in the mid-1970s, when Chile's military government abandoned socialism and started to implement economic reforms. The story of Chile's success starts in the mid-1970s, when Chile's military government abandoned socialism and started to implement economic reforms. In 2013, Chile was the world's 10th freest economy. Venezuela, in the meantime, declined from being the world's 10th freest economy in 1975 to being the world's least free economy in 2013 (Human Progress does not have data for the notoriously unfree North Korea). 1. 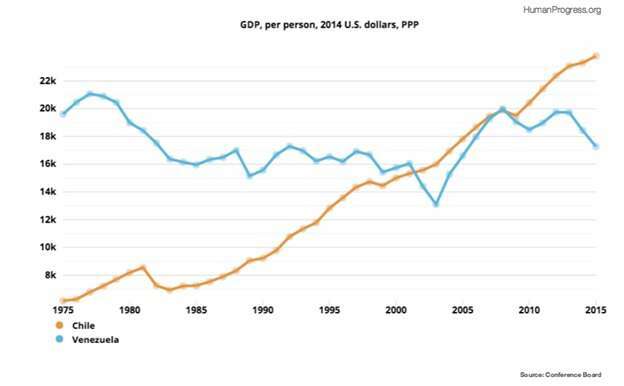 As economic freedom increased, so did income per capita (adjusted for inflation and purchasing power parity), which rose from being 31 percent of that in Venezuela to being 138 percent of that in Venezuela. Between 1975 and 2015, the Chilean economy grew by 287 percent. Venezuela's shrunk by 12 percent. 2. As its economy expanded, so did Chile's ability to provide good health care for its people. 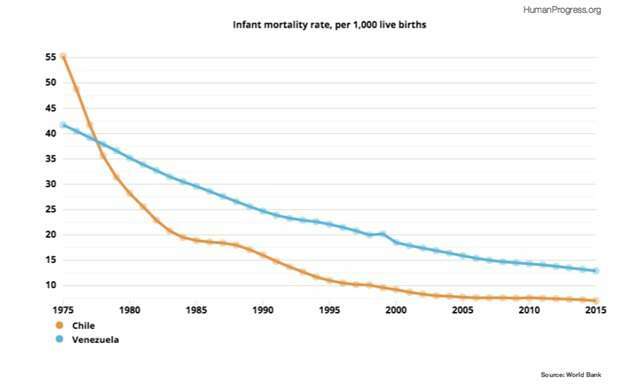 In 1975, Chile's infant mortality rate was 33 percent higher than Venezuela's. In 2015, almost twice as many infants died in Venezuela as those who died in Chile. 3. 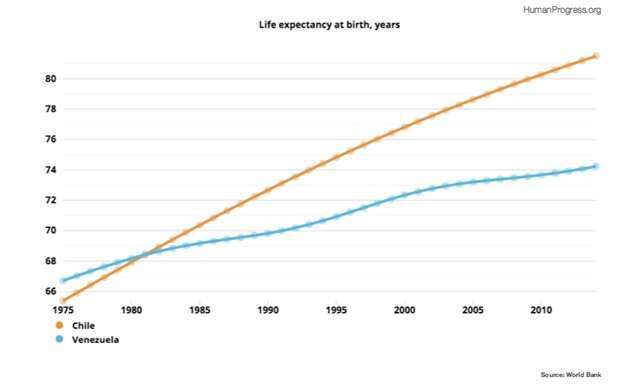 With declining infant mortality and improving standard of living came a steady increase in life expectancy. 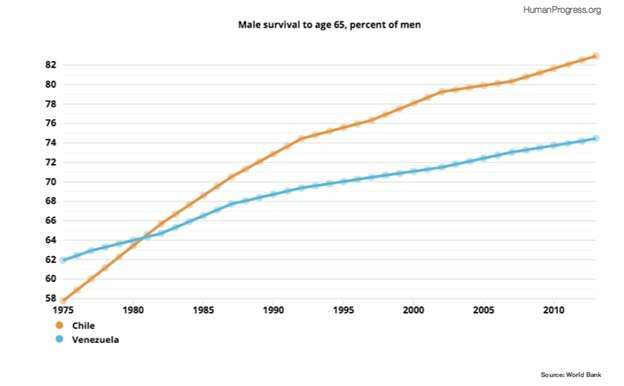 In 1975, Venezuelans lived longer than Chileans. In 2014, a typical Chilean lived over 7 years longer than the average citizen of the Bolivarian Republic. 4. 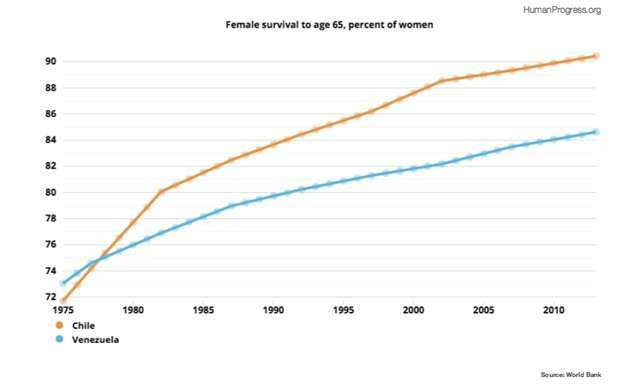 Moreover, more Chileans of both sexes survive to old age than they do in Venezuela. As they enter their retirement, the people of Chile enjoy a private social security system that was put into place by Cato's distinguished senior fellow Jose Pinera. 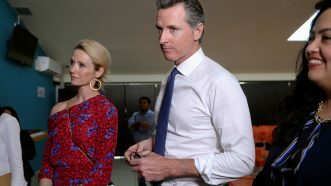 The system generates an average return of 10 percent per year (rather than the paltry 2 percent generated by the state-run social security system in the United States). 5. Last, but not least, as the people of Chile grew richer, they started demanding more say in the running of their country. Starting in the late 1980s, the military gradually and peacefully handed power over to democratically-elected representatives. In Venezuela, the opposite has happened. As failure of socialism became more apparent, the government had to resort to ever more repressive measures in order to keep itself in power—just as Friedrich Hayek predicted. 1. Chile has no toilet paper shortage. 2. Chile has no toilet paper shortage. 3. Chile has no toilet paper shortage. 4. Chile has no toilet paper shortage. 5. Chile has no toilet paper shortage. More importantly, there is no beer shortage! Hey, if you’re going to control people you first have to strip away their dignity. But, what about their gini coefficients? Speaking of which, was reading up on it. Apparently the American number doesn’t actually factor in government redistribution. That wouldn’t make much sense to me if looking for an honest number – especially since the number is often used to argue for more redistribution. The only important number is the number that makes the US look bad. The US actually ranks pretty low after factoring in redistribution, as the effect of redistribution is small in the US. Despite having the most progressive income tax system of OECD countries, transfers in the US are less targeted toward those with lower incomes. Worst of both worlds, really. 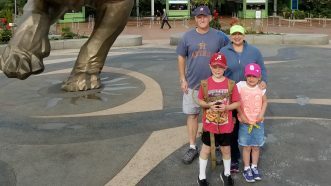 The system generates an average return of 10 percent per year (rather than the paltry 2 percent generated by the state-run social security system in the United States). Citation needed. I find it hard to believe they’ve generated anywhere close to 10% per year over the past 10 years. Yes, I thought the same. Those numbers sound too optimistic to me. We have a similar system in Mexico and the returns hover around 3 to 3.5% on average. It is unfortunate that the real inflation rate is around 4%, but, hey, beats putting your money under the mattress…. While the title is not wrong, it is unlikely to appeal to political “liberals”. I have a Chilean friend and she tells me Chileans are more “socialist” and this is why the country does well. They’re very guarded, it seems to me anyway, in the way they explain the country’s upward tick. It’s almost as if they “know” it’s capitalism but heaven forbid they say it. I watched a documentary on 3D printing last night. It’s funny to watch these tech startups with their socialist ideas, have to go capitalist to make it. Even living it, they couldn’t admit their socialist utopian ideals are wrong. Do they have municipal garbage pickup? You see, a few cooperative services IS socialism, and if a little is good, all is great. Isn’t that obvious? Why can’t you guys over 22 get that it’s so, like, logical and stuff that if signage is good, then the short bridge to Uncle Bernie and his Ministry of Deodorant and Child Hunger Obliteration is, like, way good? It’s just the stuff we do together, like you work and I figure who gets stuff. Not letting me be a Philosopher King is triggering, so you better watch it…. 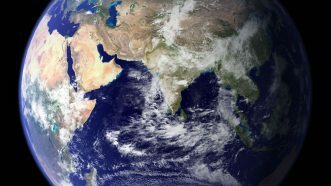 DON’T TOUCH SOUTH AMERICA. It’s the bizarro North America. I wouldn’t touch south of the border. Worst Mexican food ever. Ben Bernanke probably used to spit in it back in the day. Don’t you mean Men Jerknanke??? Last Week Tonight with John Oliver had a brief segment this week on the Crisis in Venezuela. Not once in the segment did the socialist aspect of Venezeual’s crisis get mentioned. Instead, John Oliver seemed to imply/insist that all of the tumult was at Maduro’s hands. The solution provided was removing Maduro yet the basic economic system wasn’t even questioned. Oliver is a smug douchenozzle. Dunce useful idiots are in abundance. I’m just glad La Chavista Supremo isn’t alive to see what happened to his legacy. Look what Maduro did to us, man! 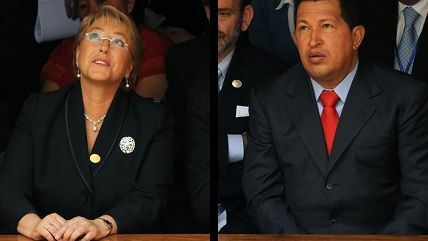 That’s the problem: The timing of developments are such as to make Chavez look better than ever. Well, it does fit in with the near 200 years of “it’s not the system, it’s just needing the ‘right’ Top Men”. Replace Maduro with Trotsky and it’ll all work out fine. Just ask Otto Strasser. If Goebbels hadn’t gone traitor, the REAL Nazi revolution would have occurred, and everything would have turned out OK. In that vein, I have the Master Plan. I know it is, because what I thought last week is what I still think today, and I think is very likely what I will think the same next week, so it’s pretty clear and bullet proof. So if you all will just harmonize around my Plan, things will work out fine. The particulars? You just have to trust me. You’ll have to “pass it to see what’s in it”. P.S. all those funds going off shore into secret accounts? That’s just to make sure the counter-revolutionaries can’t get at it. It’s for all of us, trust me. How come every graph looks like a woman spreading her legs at different degrees? And that political rights one… well, you know what happens when she’s spread that wide open. Chile has a major advantage- Carmenere. Like Merlot, but interesting. Chilean tempranillos are hella tasty as well. Venezuelans do make some tasty Empanadas. Prolly vegetarian now days. Vegetarian or not, they have no toilet paper so I wouldn’t touch any food prepared by a Venezuelan today. And can someone explain that last graph to me? It doesn’t seem to make sense or fit with the theme of the article. One line goes down, the other up. Gotta agree — at the very minimum it is counter-intuitive. The text says Chile has been getting more Politically free, but their line goes down while Venezuela’s goes up. No, as a post below explains, the numbers are probably from Freedom House, where 1 is most free and 7 is least. On that graph, down is good. Somebody fucked up and switched the crayons. They define a lower number as more freedom. That’s an even bigger fuckup. No kidding. When I read it, I put on my WTF face. Not really. The Y-Axis is the amount of political repression, not the amount of political freedom. So higher numbers = more repression. 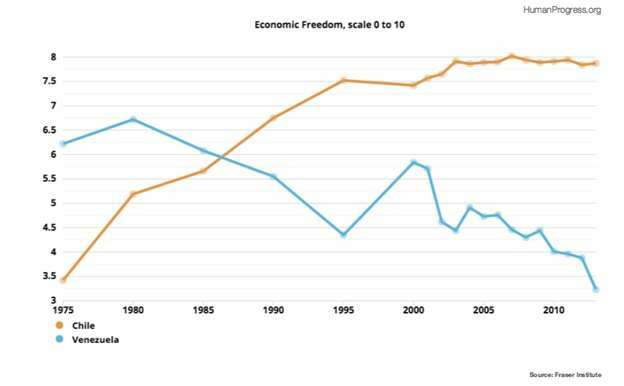 Although it is the opposite relationship of the first graph of Economic Freedom, which was higher Y values = more economic freedom, so I can see how it’s a little confusing. Nice link you got there. SF help you put that one together? Political rights enable people to participate freely in the political process, including the right to vote freely for distinct alternatives in legitimate elections, compete for public office, join political parties and organizations, and elect representatives who have a decisive impact on public policies and are accountable to the electorate. The total score awarded to the political rights checklist determines the political rights rating. Each rating of 1 through 7, with 1 representing the highest and 7 the lowest level of freedom, corresponds to a range of total scores. 1 is good and 7 is bad. 1 is the freest and 7 is the least free. It’s the same way Freedom House measures freedom, with 1 being best and 7 being worst. 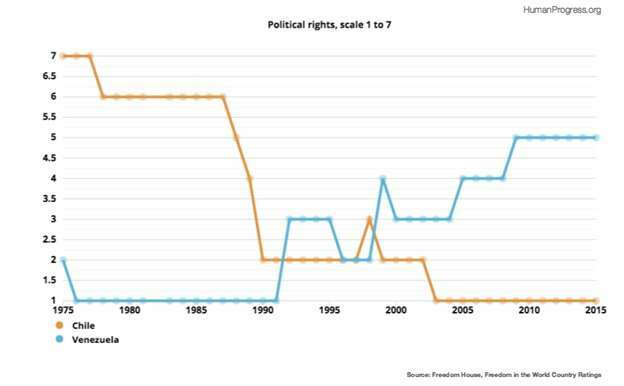 That’s fine, but the graph is labeled “Political Rights” implying that higher on the chart has more political rights — “Political Repression” would be a better label. A “key” would have been helpful too. Maybe they reason that you can’t get better than freest, but you can always get worse than least free (by contemporary standards)? As in, outright slavery etc. I have the same problem. What I want to see are the units of measure or the dimensions used to plot the zigzag. That and some Chilean Malbec. I’m not sure I believe the Venezuela numbers aren’t worse than the graphs show. They have basically no medical devices, massive shortages of food and basic goods, and so little electricity that they can now only work 2 days a week. The whole country is sliding into subsistence (or lower) levels of poverty. That’s a reason I think things are not that bad. If they were, we’d be seeing breakdown of division of labor, people fleeing cities for the countryside. Wow, that post-Pinochet improvement in political rights is staggering. What’s even more staggering is the dramatic increase in freedom during the entire “dictatorship” of Pinochet, particularly from 1975-1980. It would take a military government to get rid of socialism because the brain washed, Santa Claus believing public would never vote for it. The martyrdom of Allende is second only to the Stolen Election of 2000 in popularity among leftist tinfoil hat people. While Allende was in power, I had colleagues who traveled to Chile regularly, spoke Spanish, were politically liberal and sympathetic to Allende, and were absolutely unanimous that it was failing and would end very, very badly. I also followed affairs in Chile on the CBC. 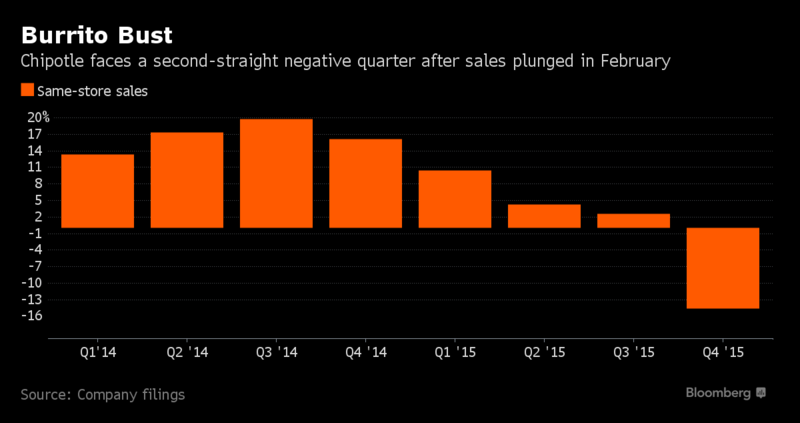 To me, the clue that things were hopeless was when Chile nationalized the trucking industry. The trucking industry was mostly small independents and could not possibly have contributed any kind of wealth to the government. I pictured them frantically ripping out sofa cushions looking for small change. “I don’t get it. We own the means of production, where did all the wealth go?” Well, the answer is that when you nationalize a factory, all you have is an empty building full of idle machinery. One group NOT to feel sorry for are the copper mining companies. About five years earlier, one of my professors, a former Anaconda VP, said Anaconda had known for a long time that it would eventually lose those mines. 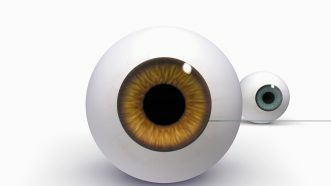 So they were not blindsided in the least and had lots of time to prepare. But then, comparing Chile to doctrinaire Marxist Chile or Venezuela is a false dichotomy. Compare it to Denmark or Finland, both of which describe themselves as capitalist market economies. Nothing is more correlated to prosperity in its many forms than freedom. This is yet another example. Too bad they don’t teach this in US classrooms. 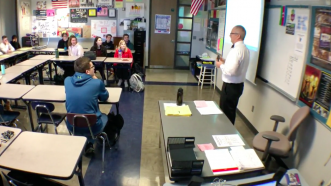 But government employees have an incentive to actually not teach it, because it might generate demand for free markets in education and threaten the gravy train of government mandated, government paid for, and government delivered education (i.e. the government “teachers” could lose their jobs teaching the truth). The first graph is incredibly illuminating. Pinochet was “dictator” from 1973-1990. He must be the oddest dictator in history, as freedom dramatically increased in the first part of his “dictatorship” from 1975-1980. Did you guys accidentally swap the names/colors on that last chart? Or is 1 supposed to be like, “First Place” in a chart like that? OT: is it mostly “progressives” who hate the tipping system?